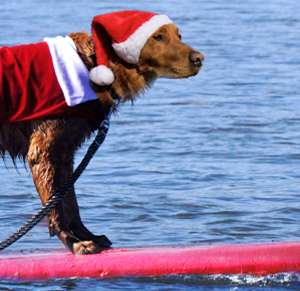 Home > Inspirational Stories > Santa Paws is Surfin’ to Town!! Santa Paws is Surfin’ to Town!! AS SANTA PAWS & ELF TO KICK OFF HOWLIDAY BOOK DRIVE! Surf Dog Ricochet traded her life jacket for a Santa Jacket to kick off her 6th annual Surfin’ Santa Paws, Howliday Book Drive sponsored by Fido Friendly. She arrived via surfboard with 8 year old West, who has autism and was recently bullied. This year, the Drive is all about saving lives. According to the Center for Disease Control, one in 12 teenagers will attempt suicide. Every 65 minutes, a veteran dies by suicide. Every 11 seconds, an animal is euthanized. In an effort to positively impact these heartbreaking statistics, Ricochet is collecting cash donations to purchase copies of her best selling book ”Ricochet: Riding a Wave of Hope With the Dog Who Inspires Millions”. The books will be distributed in memory of 13 year old Peyton James, who took his life this past October because of bullying. “Bullying and veteran suicide has become an epidemic in this country and we believe Ricochet’s book has the ability to nurture a sense of hope and empowerment to those who are struggling with self doubt”, said Judy Fridono, the book’s author. In keeping with Ricochet’s giving tradition, a portion of the book sales will go to Shelter to Soldier, a San Diego based non profit organization that rescues shelter dogs and trains them to be service dogs for veterans with PTSD. The inspiration behind the Book Drive is Ricochet’s surfing buddy, West. He was bullied by a boy at school who said “I don’t believe you’re on the cover a book… you can’t even read.” Unfortunately, children and teens who are considered “different” from their peers are the most frequent targets of bullies. What was a dog to do, but go to West’s school and lead a presentation on kindness and compassion. Through Ricochet’s book, videos and presence, she was able to make an impact without saying a word. Kids discovered how to embrace and celebrate the differences that make each of them unique and special. “After the success at West’s school, hosting a Book Drive to prevent suicide among youth and veterans just makes sense.” Said Fridono. The book contains many wonderful life changing messages to encourage, build confidence and help identify the vast ocean of potential inherent in each indvididual. Many lives have been transformed by the power of this ordinary dog with an extraordinary spirit. But, since Ricochet can’t go to every school, or interact with every veteran, the next best thing is providing her book to schools and the military. Having this resource available can assist in extinguishing suicidal thoughts while fostering a positive transformation. Ricochet hopes to get the book into as many hands as possible, but needs your help. Please save a life by sharing this Book Drive so together, we can raise awareness of the serious harm bullying and PTSD can cause. And, please give the gift of hope with your tax deductible donation of $5 (or more) at http://www.surfdogricochet.com/surfin-santa-paws.html. The books will be pawtographed and distributed to schools, veterans and service members in Iraq and Afghanistan. Ricochet’s book became an international best seller the day it was released this past June. It sparked a bevy of reviews that reflect the book’s ability to bring many to tears while resonating with everyone from age 9 to 99. “I learned that everyone is good at something and you just have to keep trying to find it. You can’t give up.”, said Julia, age 9. Others have lauded this thought provoking book for it’s capacity to help people follow their hearts. Lane, age 13 says “This book helped me learn that you have to first be true to yourself because then you can help people more than you could by being something you’re not.” Pam, an army veteran says “Ricochet’s book inspired me to never give up. It would be awesome for other veterans and active service members to read”. For more information, contact Judy Fridono at 707-228-0679 or pawinspired@aol.com. Additional details can be found at http://www.surfdogricochet.com or https://www.facebook.com/SurfDogRicochet. Thank you for your support.